NETWORK FINALS: THE VOICE gained 0.1 in final numbers. But CRAZY EX-GIRLFRIEND got hit badly when the adjustment for Chicago preemption was figured in, down by half to a paltry 0.2, with JANE THE VIRGIN down 0.1 to 0.4. CRAZY is probably lucky it already has its Season 2 renewal in hand (and that it employs no horses who can be injured). CABLE HIGHLIGHTS: TBS’s THE DETOUR premiered at a very solid 0.52/0.46, especially since the episodes had already been “previewed” around the network’s NCAA coverage. Lead-in AMERICAN DAD was at 0.59 (up 0.03 from 2 weeks ago), and later, FULL FRONTAL was at 0.26. On Syfy, the season finale of THE MAGICIANS lost a tick to 0.27, and the premiere of HUNTERS was instantly problematic, dropping more than a tenth from its lead-in to 0.16, not even a great rating for a Canadian import, let alone an A-level series. With the NCAA Tournamenet out of the way, VH1 and USA were in their accustomed places at the top of Monday cable. On VH1, LOVE & HIP-HOP was down 0.05 to 0.44, and BLACK INK CREW slipped 0.03 to 1.18. USA’s WWE telecast was at 1.31/1.25/1.30, compared to last week’s 1.60/1.56/1.48. MTV’s TEEN MOM rose 0.06 to 0.94, with an after-show special at 0.63, up 0.15 from last week’s post-show. AMC’s BETTER CALL SAUL ticked up to 0.82. 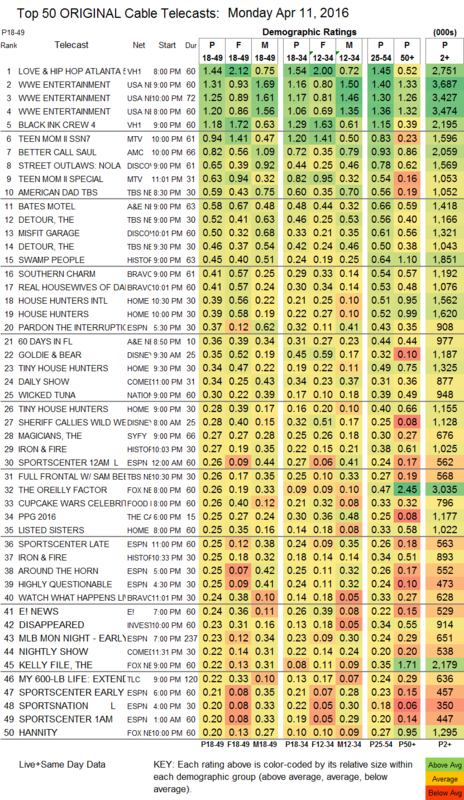 On Discovery, STREET OUTLAWS gained 0.08 to 0.65, and MISFIT GARAGE was up a hundredth to 0.50. On A&E, BATES MOTEL returned from a week off up a tick to 0.58, and DAMIEN also gained a tick to 0.18. On History, SWAMP PEOPLE edged up 0.02 to 0.45 and IRON & FIRE was at 0.27/0.25. On Bravo, SOUTHERN CHARM was up 0.02 to 0.41, and REAL HOUSEWIVES OF DALLAS premiered at 0.41, low for that franchise. On HGTV, both HOUSE HUNTERS and HOUSE HUNTERS INTL were at 0.39 (up 0.08 for HUNTERS), and TINY HOUSE HUNTERS was down 0.03 to 0.34, with LISTED SISTERS at 0.25. 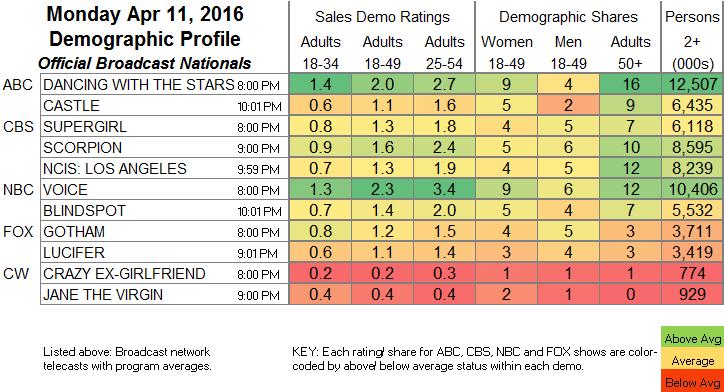 Food Network’s CUPCAKE WARS was at 0.26, and CAKE MASTERS was at 0.19. Logo’s RUPAUL’S DRAG RACE ticked up to 0.16, with lead-out GAY FOR PLAY at 0.08/0.07.